WASHINGTON (April 23, 2010) -- At Boeing labs in Huntington Beach, Calif., engineers are integrating the equipment and software that forms the backbone of the Army's Brigade Combat Team Modernization effort: the network. 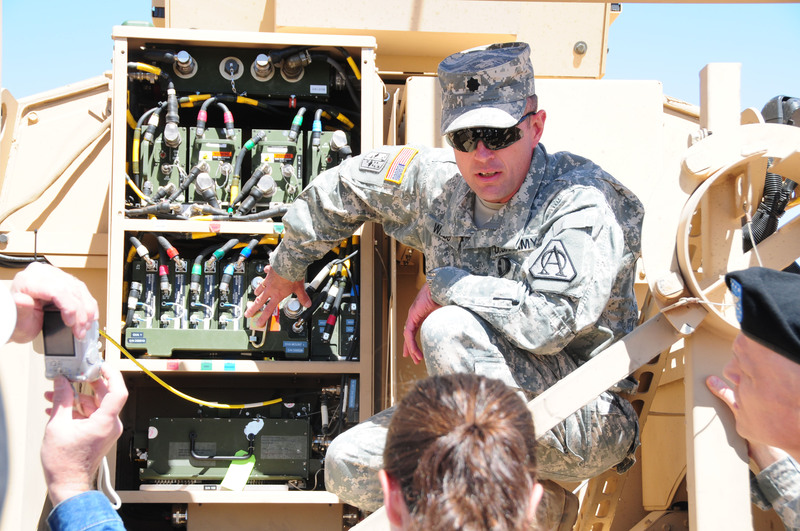 Network Integration Kits are the centerpiece of the network component of the BCT Modernization program. The kits include both new and existing equipment as well as new software. Each part of the kit must be tested to ensure it works as expected when connected -- and engineers are doing that today. NIKs will be installed into Mine Resistant Ambush Protected vehicles, MRAP All-Terrain Vehicles, Humvees and other Army tactical vehicles. The NIK allows equipped vehicles to pass data, including such things as imagery with Soldier-inputted annotation, voice, and both Soldier and enemy position from any of the information systems, into the network. That information can be shared across the network by other NIK-equipped vehicles. The NIK software and equipment is moved through three phases of testing and evaluation, including a phase where software is tested strictly on desktop computers -- entirely inside a virtual environment. At one lab, for instance, some 3 million lines of code are being validated to ensure their compatibility. Another testing phase puts software back onto its host hardware, where the equipment is integrated and validated in a bench environment. Finally, both the software and hardware are tested together in a real-world environment, by being integrated into combat vehicles and tested at Fort Bliss, Texas. Existing NIK components include the Single Channel Ground and Airborne Radio System, the Enhanced Position Location Reporting System, the High Frequency radio, UHF SATCOM, Future XXI Battle Command Battalion/Brigade and Below, and Blue Force Tracker. New components of the NIK include the Integrated Computer System, which runs the Department of Defense's System of Systems Common Operating Environment, and the Joint Tactical Radio System, Ground Mobile Radio. The JTRS (pronounced "jitters" ) GMR has up to four transceivers, each capable of running a different waveform. A single channel of the radio, for instance, can move data equivalent to 120 SINCGARS radios. The combination of ICS and JTRS GMR ties everything in the vehicle together and pushes information to the existing FBCB2 display panel. The radio also ties multiple vehicles together. The radios seek each other out, and attempt to build ad-hoc networks between themselves. In fact, the JTRS GMR ties vehicles, Soldiers, and sensors together along with anything that communicates on more than a dozen radio waveforms and communications bandwidths. The JTRS GMR handles the communications capability, the ICS running SOSCOE brings the information together, and the FBCB2 system displays results to the Soldier. "We fuse all that imagery through the Network Integration Kit and pull it together and put it on his common operating picture, the FBCB2 screen that is on all of his platforms that have NIKs," said Col. John Windall, the program manager for IBCT under PEO Integration. Imagery comes from equipment such as the Class 1 Unmanned Aerial Vehicle, the tactical and urban Unattended Ground Sensors, and the Small Unattended Ground Vehicle. Additionally, information added by one Soldier in one vehicle -- such as an image of an enemy combatant, tagged with information about that enemy -- can be shared across the network by all Soldiers that need to know. "The Soldier can now see where his blue force is and the icons that represent red forces that have been in contact," Windall said. "It's really putting the data together and making it accessible. And then that network has this great range, great redundancy and capability -- it's a robust and scalable network." That robust, scalable network -- the heart of which is the JTRS GMR -- recently demonstrated an ability to network with its nearest neighbor, more than 20 miles away. "We had WNW up and it is pinging for other nodes on the network," said Jerry Tyree, director of integration, director of operations at White Sands Missile Range, N.M. "Unplanned, it joined the network with another vehicle ... about 20 miles away. And, after it joined, and they saw it joined ... they passed an image over that." Tyree said more tests need to be done to validate that extended capability -- but that "it's very encouraging, very initial ... significantly a step forward from where we have been." Ultimately, the NIKs will be installed into Mine Resistant Ambush Protected vehicles, MRAP All-Terrain Vehicles, Humvees and other Army tactical vehicles. The NIK allows equipped vehicles to pass data, including such things as imagery with Soldier-inputted annotation, voice, and both Soldier and enemy position from any of the information systems, into the network. That information can be shared across the network by other NIK-equipped vehicles. Twelve NIK-enabled vehicles will participate in an upcoming Limited User Test at Fort Bliss and White Sands so Soldiers from the Army Evaluation Task Force can test the equipment in a more real-world-type environment. Those 12 vehicles include five MRAP-ATVs, six Caiman MRAPs, and one MaxxPro MRAP. It's at White Sands where the JTRS GMR is, for now, being installed into tactical vehicles. Engineers there find ways to route cables through the vehicles and where to place the equipment. They are also faced with questions such as should the radio equipment be inside the crew compartment -- already packed with equipment on some vehicles -- or outside, where it is more vulnerable to damage. In a work bay at White Sands, a Soldier and Marine install equipment into an MRAP vehicle. The bulk of that equipment is in a rack on the outside of the vehicle, in an exposed compartment meant to hold Soldier's gear. Included on the rack is both the JTRS GMR and power supply equipment. Tyree said it's possible that some of the new equipment could be moved inside the cabs of the vehicles they serve, because the GMR actually could replace some of what's in the cab already. "There are three radios inside the cab of that vehicle now," he said. "There are some other radios in here that the GMR could really do the job of." But the inside of the MRAP cab is crowded, and Tyree said if equipment that's inside could be removed due to the addition of the GMR, and the GMR remained outside the vehicle, that would clear up room for Soldiers inside. The next step for the BCT Modernization and for testing of the JTRS GMR is the LUT in August and September. Soldiers will be hard on the equipment, said Windall, and the Department of Defense will use information from the LUT to make decisions on the future of the program. "Pretty much it's a make or break year for the program, and a LUT will inform that decision on fielding," Windall said. "But right now we are moving forward and the Army has bought the first brigade's worth of the equipment and we are putting them on M-ATVs right now."